Cyril of Alexandria, Commentary on John, LFC 43, 48 (1874/1885). Vol.2 Introduction. pp. iii-xvi. 34 KING STREET, COVENT GARDEN. More than eleven years have passed since the first volume of a translation of S. Cyril's Commentary on S. John was given to the world by the late Mr. P. E. Pusey. The volume was introduced by a Preface, the greater part of which was written by the translator's father, Dr. Pusey, and mainly with a view to showing that S. Cyril's language on the subject of the Procession of God the Holy Ghost from the Father and the Son is substantially identical with that of the Greek Fathers of an earlier age. This Preface was in part intended as a contribution to the then expected discussion of the subject at the Reunion Conferences which, in the event, were held at Bonn, under the presidency of Dr. Döllinger, in the autumns of 1874 and the following year. The translation itself was reviewed by an English critic in terms which rendered its humble and too self-distrusting author unwilling to resume it. At his death, on Jan. 15th, 1880, nothing more had been done. But Dr. Pusey, who all along had been anxious for the completion of the work, entrusted it to a scholar who was at the time |iv taking up his residence in Oxford, the Rev. Thomas Randell, M. A., of S. John's College. Mr. Randell's distinction as a Classical Student had heen already attested by the honours gained by him in the London University; and Dr. Pusey early formed and expressed a very high opinion of his "wide and solid" accomplishments as an Orientalist----an opinion which has been amply justified by the successes which Mr. Randell has achieved in his adopted University. "It was at my wish that, in his uniform filial love, my son took as the central work of his life to make the text of S. Cyril's works as exact as it could be made. For this he visited libraries in France, Spain, Italy, Germany, Russia, Mount Athos, Cairo, Mount Sinai, and applied to this the knowledge of Syriac which he had perfected in view of another object 1." The work of editing the original text was to have been completed in ten volumes. It remains, alas! a splendid fragment, consisting of six volumes and a-half; which, unhappily, do not include the |v Thesaurus. But in Dr. Pusey's judgment the greatest of S. Cyril's works is his Commentary on S. John 2, the original text of which is given in the third, fourth, and fifth volumes of Mr. Pusey's edition. This original text consists of 1636 pages octavo, partly Greek and partly Syriac. Of these the first 863 pages were translated into English by Mr. P. E. Pusey himself; the translation forms the first volume of the present work. For the translation of the remaining 773 pages contained in the present volume Mr. Randell is responsible. "There is no hurry about the translation of S.Cyril. I only wished to have my dear son's work completed. Mr. Jebb, I think, thought his translation rather quaint; so it would not be a model for you. Every one must translate in the way most natural to himself. I should think that you would do well to read yourself into S. Cyril's style before you begin the actual translation. It will flow rapidly then. Your translation will, I fear, be at a disadvantage, because it begins with fragments of the lost books." "I have just had the first 52 pages of your MS., as set up, to read over. I have ventured to change the προτείχισμα, which you had rendered 'fortification,' into 'outer wall,' for it represents [Hebrew]; but perhaps you left it on purpose, as our version always renders by some general term 3. I only looked at the pages to see that they came to you, as they should. But I found that they read pleasantly, which is a great gain for a writer who uses so many compound words as S. Cyril." In truth, the difficulty of translating S. Cyril lies not only in his compound words but in his long and involved sentences----the product of his sustained and anxious thought. But the correction thus suggested is the only one made by Dr. Pusey. Dr. Pusey read through and approved of the first 176 pages of the present volume, which alone were set up in type before he was himself taken from us, at Ascot Priory, on September 16th, 1882. Dr. Pusey's death, as was inevitable, seriously interrupted the progress of the work. The Holy Rood Press, at which the book was being printed, was broken up. In Dr. Pusey the last surviving editor of the Library of the Fathers was withdrawn from this earthly scene. Dr. Pusey's executors were for |vii some time engaged in making arrangements with a new publisher, and other difficulties presented themselves. But at length a fresh beginning was made. From page 177 onward the volume has been printed at the Oxford Clarendon Press; and every care has been taken to secure uniformity, not only between the two portions of this volume, but also between the whole volume and its predecessor. Indeed the work, as a whole, has been considerably enriched by Mr. Randell's industry. Through an inadvertence, some copies of the first volume had no Table of Contents, while other copies were furnished with an erroneous one. In order to remedy this as far as possible, Mr. Randell has provided the present volume with a Table of the Contents of both. The first volume, too, was published without any Index. At the end of the present volume are subjoined full Indexes to both. The translator has also been careful to note in the margin of the second volume those passages of the Commentary in which the translation has been made from the Syriac version. It may not be undesirable to remind the reader that S. Cyril used a text of the New Testament which is not quite identical either with that of any known ancient manuscript, or with any conjectural text that has been constructed by modern scholars, or with the Textus Receptus. Accordingly, in translating passages of the New Testament that occur in the present volume----whether passages of the Holy Evangelist upon whom S. Cyril is commenting, or |viii incidental quotations in the Commentary itself----especial care has been taken to render S. Cyril's own text as exactly as possible. Whenever therefore the rendering is not identical either with the Authorised or the Revised Version, the reader may be assured that there is a corresponding difference in the Greek or Syriac text as exhibited by S. Cyril. Moreover, quotations from the Old Testament will often be found to differ from the corresponding passages of our English Bible, because they are taken from the Greek version of the Septuagint, and not from the original Hebrew text. "I cannot help hoping, that if dear Philip is allowed, now or hereafter, to be anywhere near S. Cyril in another world, S. Cyril may be able to show him some kindness, considering all that Philip has done in these later years to make S. Cyril's writings better known to our countrymen." Since these words were uttered father and son have met again after their brief separation. And it may be that they have also been permitted to hold converse with the great Alexandrian Father before the Throne of that adorable and deeply-loved Redeemer, Whose Glory, Divine and Human, each of the three, according to his measure and opportunity in the days of earthly work and trial, did so much to set forth. Feast of All Saints, 1885. 1. 1 Preface to Translation of S. Cyril against Nest., p. cv. ; dated Christmas Eve, 1881. 2. 2 Vol. I., Preface, p. viii. 3. 3 This correction was adopted, cf. p. 10. Comprising S. John i. 1-i. 26. Comprising S. John i. 29-v. 34. Comprising S. John v. 35-vi. 37. Comprising S. John vi. 38-vii. 24. Comprising S. John vii. 25-viii. 43. Comprising S. John xii. 49-xiv. 20. Comprising S. John xiv. 21-xvi. 13. Comprising S. John xvi. 14-xviii. 23. Comprising S. John xviii. 24-xxi. 25. SUBJECTS DISCUSSED OR ILLUSTRATED IN VOL. I. God the Father : Love of, 174. Mercy of, 176. Omnipotence of, 14. The Father and Son : Co-existent, 13, 15. Co-inherence of, 13, 32, 123, 192, 427 et seq., 572, 575, 665, 674. Consubstantial, 17, 22, 58 et seq., 147, 174, 243, 246 et seq., 266 et seq., 349 et seq., 389, 404. Equality of, 23 et seq., 54, 55, 245 et seq., 261 et seq., 274 et seq., 576, 607, 611. The Son : Atonement of, 132, 148. Begotten of the Father, 13, 14, 159, 478, 520, 568, 584. Bridegroom, 157, 182. Conception bv the Holy Ghost, 637, 642. Divinity of, 111, 115, 153, 183, 166, 174, 281, 292, 295, 308, 322, 395, 400, 415, 424, 522, 556, 586, 600, 604, 607 et seq., 661, 676, et passim. Eternity of, 7 et seq., 193, 254, 644, 680. Incarnation of, 108 et seq., 138, 197, 547 et seq. Inherent authority of, 258. Judge, 270 et seq., 432, 570, 597. Lawgiver, 309, 313. Manhood of, 204, 214, 218, 252, 293, 309, 328, 334, 424, 671. Mediator, 308. Omniscience of, 201, 457, 477, 611. Oneness of, 172, 348, 435, 453, 455, 563. Perfect God, 24 et seq., 62 et seq., 135 et seq. The Holy Spirit : Divinity and Consubstantiality of, 107, 167. Gift of, 142, 194, 207, 547. The Spirit of the Son, 80, 106, 108, 111, 143, 145, 251, 436, 438, 547, 548, 550, 552. Union of Son and, 145, 194, 436 et seq. 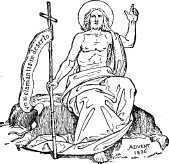 The Holy Trinity : Distinction of Persons in, 17 et seq., 43, 54, 147, 300, 355 et seq., 402, 612. Equality of the Persons of, 264. Unity in, 53, 277, 304, 386, 401, 425, 618. Arius, 22 et seq., 204. Baptism, Holy, 129,168,178,182, 294, 551. Eucharist, The, 347, 374 et seq., 411, 417 et seq. Faith, Gradual growth of, 165. Gentiles, Reception of, and rejection of Jews, 102, 158, 160, 202, 223, 230, 235, 316, 332, 334, 379, 440, 458, 467, 542, 563, 596, 603, 683 et seq. Law, Prophecies and types of, 126, 127, 173, 307 et seq., 317, 361 et seq., 400, 407, 412, 445 et seq., 466, 474, 491 et seq., 543 et seq., 624, 636, 653, et passim. Superiority of Gospel to, 118,119, 176. Typical and imperfect nature of, 106, 158, 228. SOUL, Immortality of, 109. Not pre-existent, 90 et seq. SUBJECTS DISCUSSED OR ILLUSTRATED IN VOL. II. God the Father, 500 et seq. Perfection of, 9. The Father and Son : Co-inherence of, 264 et seq., 544 et seq. Consubstantial, 93, 99, 105, 153, 162,165,168,171,175, 221, 242 et seq., 255 et seq., 352 et seq., 363 et seq., 481, 498, et passim. Equality of, 94, 102, 105, 344 et seq., 431. One Will of, 93. The Son, 55, et passim. Begotten of the Father, 83, 128, 162, 169, 247, 258 et seq. Creator, 19, 27, 419. Divinity of, 50, 57, 81, 82, 84, 86, 92, 99, 101, 117, 130, 141, 148, 149, 155, 157, 162, 164, 169, 181, 202, 209, 213, 235, 246 et seq., 256 et seq., 352, 427, 439, 471, 486 et seq., 511 et seq., 523 et seq., 564 et seq., 613, 664, 666, 683, et passim. Incarnation of, 93, 100, 139, 169, 170, 233, 245, 263, 315 et seq., 345, 394, 441 et seq., 517, 521, 541. Manhood of, 83, 84, 86, 101, 121, 122,126,148,150,155,165,243, 301, 348, 439,482,503,526,665. Mediator, 243, 465. Omnipotence of, 516. Omniscience of, 111, 173, 202, 473. Oneness of, 56, 146, 213, 693. Perfect God, 128, 221. Procession of, 265. Uncreate, 257. The Holy Spirit : Divinity of, 304. Faith in, 305. Gift of, 73, 386, 675. Procession of, 265. The Spirit of the Son, 269, 302, 318, 321, 326, 338, 451, 454 et seq. Uncreate, 331. The Work of, 363 et seq., 443, 444, 449, 536 et seq., 551, 592, 680. The Holy Trinity : Distinction of Persons in, 102, 108, 233, 264, 303. Faith in, 233, 244. Unity in, 102, 107, 108, 127, 159, 162, 165, 192, 234, 250, 255, 262 et seq., 296, 307 et seq., 355, 364 et seq., 432, 534. Baptism, Holy, 19, 20, 54, 109, 119, 177, 645, 659. Eucharist, The, 19, 20, 100, 200, 370, 550, 645, 659, 684. FAITH, Confession of, necessary, 119. Power of, 125. Produces spiritual worship, 58. Proper object of, 55. Rewarded, 54, 470, 691. Safeguard, A, 233. Without works is dead, 187, 376, 389 et seq. Free-will, 188, 518 et seq. Gentiles, Reception of, and rejection of Jews, 18, 22, 43, 57, 87, 88, 109, 134, 142, 145, 146, 156, 379, 626. Law, Prophecies and types of, 38, 45, 47, 80, 87, 88, 157, 160, 167, 168, 197, 208, 236, 346, 348, 359, 429, 507, 583, 594, 605, 606, 609, 615, 618, 621, 622, 628, 630, 636, 637, 639, 645, 686, 689. Superiority of Gospel to, 66, 100, 156, 216, 217, 406, 424, 430, 528, 574, 576, 696 et seq. Typical and imperfect nature of, 43, 168, 335, 627, 631, 639, 673. Punishments, 1 et seq. Resurrection, 73, 85, 117, 131, 315, 557, 682. The life after, 74, 325, 467. Sabbath, The, 23 et seq.